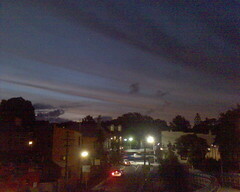 Streaks of clouds coloured pink by the sunset over Glebe. Taken looking down at Glebe Point Rd from the Broadway shopping centre car park. Not sure which is the better photo of these two. The first has better colour and more movement, with the bus, but the second has better balance, with the white building centred. So hard to choose between the two. I need a mobile phone with a better camera, or a camera that is easy to just carry round in my pocked all the time. 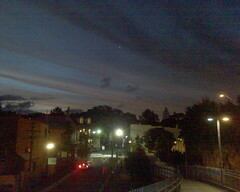 This entry was posted in Photos and tagged clouds, Glebe, photo, sunset. Bookmark the permalink.